The time has come around again to inform you of our upcoming surf yoga retreat in Costa Rica. Week to commence January 27th to February 3rd. The yoga will be led by Lori Bonazzoli and the surfing by Oliver Davies. The retreat will be 7 nights, 8 days in luxury accommodation right by the perfect beach of Guiones, Costa Rica in the fringes of the surrounding jungle. Private rooms will be $2600PP, Couples $2100PP and shared rooms are $1750PP. There will be alternating days of two yoga sessions and one surf lesson and one yoga session and 2 surf lessons. Prices include: all food, transportation and accommodation at Jade retreats, Guiones. Flights are separate and you will fly into Liberia, Costa Rica. Basically, we will take care of the details so you can focus solely on your yoga practice and learning to surf. For availability and bookings please email Lori or Oli at lori@balancedyoga.us. Photos Courtesy of Mike Grappone. 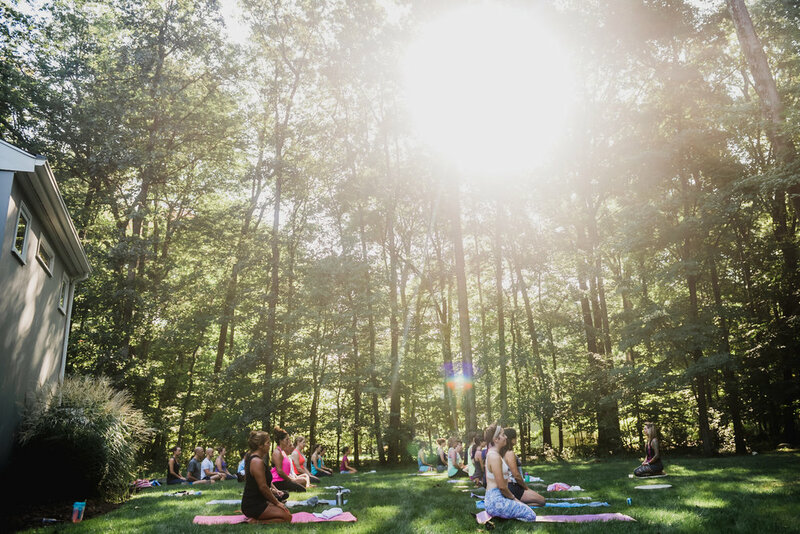 Once again, Balanced Yoga is hosting a YogaFest from dawn to dusk. Festivities will be held on the lawn at 141 Newton Road, Woodbridge. The day will be filled with Vinyasa Yoga, Acro Yoga, Dancing, Music, Gongs & Drums, Mala-Making class w/Earthbound Yoga Design (small fee for supplies) and Meditation. Food will be provided, courtesy of Balanced Yoga. It's our way of bringing our community together to say thank you. PS The day is FREE. We only ask that you donate $20 (cash only) to help Great Dawg Rescue continue their quest to save one dawg at a time. 100% of all donations will be given to GDR. 2016 Photos Courtesy of Meg Babcock. Thai massage is a healing technique administered through a series of supported yoga postures that allow for deep stretching, therapeutic breathing, and relaxation for both the giver and the receiver. Students will learn basic methods and principles of a simple Thai Yoga Massage for the legs and feet. This 2-week training will cover a brief history of Thai Yoga Massage, cautionary measures, finding and palming/thumbing the sen lines, postures for the client and practitioner. Emphasis will be place on alignment for both the client and the practitioner in addition to an understanding of the physiological principles of muscle stretching applicable to the protocol. Students watch, give and receive the treatments. Heather is a yogi, therapist, teacher and choreographer obsessed with all forms of movement. She graduated with a Masters Degree in Dance/Movement Therapy from Hahnemann University and an undergraduate degree in English Literature and Dance Theater from James Madison University. She studies and teaches yoga, Pilates, modern dance, massage, Thai Yoga Bodywork, movement theory, physical theater, and a host of obscure movement practices that delight and distract her on a daily basis. She is a licensed massage therapist. In addition to teaching at The Nest, Heather teaches at James Madison University and Cedar Stone Massage School. She is a partner and therapist at Cedar Stone Spa and is lucky to perform and choreograph for two dance companies: Working Title Productions and Shojorakudava. She is co-owner of Living Retreats in Costa Rica, a retreat center dedicated to teaching the world to surf and do yoga. Heather is blessed to live in the valley and has a magic life, complete with cool dog. *Students wishing to receive CEU hours for NCBTMB require a $75 fee for stamped and submitted certification papers. All participants will receive certification of completion mailed to a US address.